bmibaby – deliberately splitting up families and seating children out of reach? Something is rotten in the state of Derby ... to be precise, Castle Donnington where bmibaby are headquartered. The three of us travelled across from Belfast International to Birmingham with bmibaby on Tuesday for a half term family visit. Three of us on the one booking. Checking in online, Cheryl and I were given D and E seats in one row, while Littl’un had the C seat across the aisle in the row behind. A woman noticed what had happened – I was going to sit in Littl’un’s allocated seat – and volunteered to swap so we could all sit together. Seemed strange that a child of four travelling with adults would be allocated a seat in a different row. bmibaby’s booking form captures the age of children (they call them “kids”) at the time of booking. It’s not a matter of turning up late to check-in and finding no suitable sets of seats available. Online check-in happens hours and even days before check-in closes. This morning at Gate 41 in Birmingham airport’s Terminal 1, bmibaby’s gate staff were busy ensuring that everyone who had checked in online could “comfortably” fit their luggage “into the bmibaby airport hand baggage gauge” before boarding – single item per person, no larger than 55cm x 40cm x 20cm – thus squeezing an extra £30/€30 out of anyone who hadn’t read or believed their paperwork and whose oversized bags would have to be carried in the aircraft hold. When asked about families being split up by the online check in process, the same ground crew suggested that families should pay the £3.99/€5 per person charge when booking to pre-assign a contiguous block of seats. It feels like a recent problem. We’ve been travelling over with Littl’un via bmibaby to Birmingham since she was born, and the online check-in seat allocation seems to have become less capable in the last few months. It never used to split us up as a family. Smells of profiteering by the budget airline with the 65p/minute customer service line. Once onboard, flight crew were a bit more helpful, suggesting that the answer was to wait until everyone was boarded and then find any spare seats, or negotiate with other passengers. The family of five did just that, eventually managing to get all five of them into the one row. If parents didn’t use their common sense to override bmibaby’s crazy seat allocation algorithm (which seems to ignore the age of young passengers that has been captured at time of booking), would it be safe for a four year old to sit in the row behind her parents, or across the aisle? After all, I’ve listened to the safety announcement often enough to remember that it explains that if you are travelling with small children: “Put on your own oxygen mask before helping children with theirs”. How would I do that across an aisle or reaching into the row behind? CAA guidelines ask airlines to develop procedures for the seat allocation of family groups, particularly when a group includes children. It is probable that family group members would seek each other out should an emergency evacuation be required, an action that could adversely affect the passenger flow rates towards emergency exits and might seriously affect the outcome of an evacuation. Seat allocation procedures for family groups and suitable seating arrangements for large parties of children should reflect the above criteria. Whenever small numbers of infants and children are travelling together, the airline should make every effort to ensure that they are allocated seats where they can be readily supervised by the responsible accompanying adult in both normal and abnormal conditions. I referred to Malachi O’Doherty’s challenging blog post and podcast during this week’s Blogtalk NI. Along with other diverging statistics, in North Belfast life expectancy differs by a massive fifteen years between Ardoyne and Fortwilliam. Well worth listening to the podcast linked to from his blog post. If I’d been around last night, I’d have tried to head across to Titanic Quarter so see its first piece of commissioned public art launched as part of Belfast Festival. Artist Tony Stallard was to give a talk and then unveil his "Kit" sculpture in the ground floor of the ARC Abercorn Residential Complex (ARC). 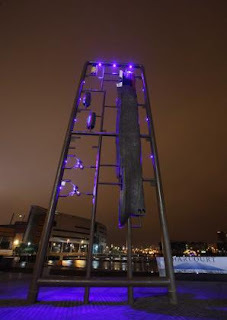 One hundred years after Belfast's ship builders put together the original vessel, scale replicas of its component parts have now returned to docks in the form of an innovative public artwork. 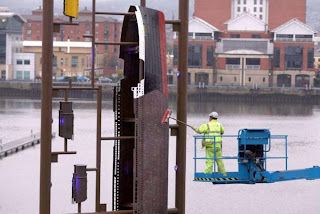 Fittingly, present-day engineers from Harland and Wolff - the firm that built the famous passenger ship - helped in the construction of the towering bronze sculpture, which is inspired by the plastic frames synonymous with Airfix model kits. Standing at 13.5 metres tall, the £200,000 piece was designed by English artist Tony Stallard and has been erected on the former shipyards at Belfast Lough. ‘Kit’ will be highlighted with blue and white phosphorous lighting at night. The Essex-born artist said he hoped the artwork symbolised Belfast as an industrial pioneer at the time of building the Titanic. "It references the industrial heritage of the area and can be seen as a reverie of the past, to create nostalgia of what was once heroic," said Mr Stallard. "It is designed to act as a contemporary tribute to the shipbuilders. The sculpture is 'see through' and transient, almost mythological." Mike Smith, chief executive of Titanic Quarter hailed the artwork. "The Tony Stallard sculpture is magnificent," he said. "At Titanic Quarter we are building the future from the past and Kit, with its references to the Titanic's creation and the industrial heritage of the area, is a perfect illustration of that." Blogtalk NI is back - if it was reality TV, at least one of us would be voted off each week! So after the pilot episode in September, NvTv's Blogtalk NI is back with a weekly run of four grumpy bloggers on a couple of sofas chewing over a few topics they've been reading about on local blogs. This week's show was brought to you by Matt, Geoff, Alan and Donal, with topics ranging from Trafigura, to the availability of public data and information online, the recent joint statement by the SDLP and UUP about education and finally a word from Mick Fealty about the origins of the Slugger O'Toole group blog. The panel will rotate over the incoming weeks so you won't be lumbered with me too often! And I'm sure carl AT northernvisions DOT org would love to hear from any female bloggers who'd like to sit and chat on the sofa in future episodes. I’ve posted about local council websites a couple of times recently. Some offer their ratepayers a lot of visibility of council business, publishing an online calendar of meetings (some of which the public can even attend) and following these up with links to the approved minutes. But some councils seem to live in a world of obfuscation - either deliberate or by inaction - and give very little information to the ratepayers who they serve. If politicians want members of the public to take an interest in what they do and come out in greater numbers to vote at elections, perhaps they would need to up their game on accountability and transparency. The Information Commissioner’s Office is the UK’s independent public body set up to promote access to official information and protect personal information. They enforce and oversee the UK’s Freedom of Information Act. They offer best practice advice to public authorities, as well as mandating a Model Publication Scheme that had to be adopted by 1 January 2009. Having mentioned Belfast and Lisburn City Councils in the post, someone suggested looking at Magherafelt District Council. The ICO even give specific examples of the kinds of information that they expect district councils in Northern Ireland to provide in order to meet their commitments under the model publication scheme. This includes information (online or offline) about recent election results, timetable of council meetings, register of councillors interests etc. Magherafelt District Council mention none of this information in their current publication scheme which is still dated January 2003 ... missing the ICO’s 1 January 2009 deadline by a country mile. And fundamentally, no council minutes online. So I asked them about it. And exactly twenty days later I got a response (at half six in the evening). Odd how it takes exactly twenty days to answer questions! Even worse the text of the emailed reply suggested that they hadn’t started processing my request until day twenty and then seemed to be answered in a rush. Can I have a copy of your minutes? Council minutes are not presently available in an electronic format. Paper copies may be obtained on payment of the requisite photocopying charge as detailed in the Councils Publication Scheme. Please advise if you are willing to pay the relevant charges and arrangements will be made to invoice you for the requisite amounts. Council minutes are not presently published online. Their publication scheme outlines the photocopying charges that were set back in 2003 and presumably have not been reviewed since. A minimum charge of £10 will apply. Where, on making his request for information, the applicant expresses a preference for communication the authority shall so far as is reasonably practicable give effect to that preference. Many public authorities offer an Internal Review “appeal” process that allows someone independent of the original respondent to reassess the decision to withhold information - and avoids objections reaching the official ICO complaint process too quickly! So in the strong likelihood of electronic copies being internally available, I asked them to consider whether it would be reasonably practical for the Council to forward them to me by email as requested. Copies of the minutes from January to May/June 2009 are attached to this email. It should be noted that the attached PDFs were scans of the printed minutes, not searchable without OCR! Remarkably, it took exactly twenty days for their response to the internal review - once again missing the spirit of the ICO’s expectation that “internal reviews should also be completed promptly”. Do you have an offline policy? Intrigued that there didn’t seem to be any increase in the information published online in the six and a half years since their Publication Scheme was issued in January 2003, I also asked whether it was their policy to not make this information online. Can you provide documentation (not limited to council or committee minutes) that explain the council's strategy and policy on access to council services through online/web by rate payers within the Magherafelt Council area. The Council does not hold the information requested. This didn’t feel quite right. Given the very rapid and last minute response to my request, I feels likely that little effort was able to be put into discovering the evidence to answer question five. Magherafelt District Councils Publication Scheme is dated January 2003 and specifically rules that some information is available online on the council website and some is not. The Council’s website was revamped in the six and a half years subsequent to the Publication Scheme being issued. The 2007 copyright notice at the bottom of each website is one such clue. Difficult to believe that decisions were not made and documented about what council services would be made available online as part of the process of tendering or specifying the requirements for the revised Council website. And it is difficult to believe that the Publication Scheme has not been formally reviewed (even if left unchanged) in the six and half years subsequent to its publication, resulting in discussion and note of whether to extend the material or services made available online. To still have so little information and so few services available online perhaps points to a deliberate and continued strategy that is likely to have been reviewed and renewed at intervals. So I asked whether they would reconsider their response to question five in case a less cursory search would show that they did hold discoverable information that explained the council’s strategy and policy on access to council services through online/web. Alternatively, they might want to confirm the kind of assets did not hold this information. Meeting 08/03/2005 – It was resolved that arrangements be made for the Minutes of Council meetings to be put on the Council’s website as soon as possible. Meeting 13/11/2007 - It was resolved that the council would only allow external links to official Government websites. Meeting 17/01/2006 – It was noted that Mr Johnston advised that they were acutely aware that a number of the members had expressed concerns regarding the standard and level of presentation on the council’s website. He reported that following internal discussions regarding this matter the Chief Executive had instructed each department to visit their section of the website on a monthly basis and provide updates as appropriate. So there was more information not provided in the response to the original FOI request. And although the council resolved in March 2005 to publish Council minutes on their website as soon as possible, four and a half years later, they still haven’t managed it. Picking on Magherafelt District Council might seem a bit unfair. It’s a reasonable case-study into what happens when you apply FOI, and then request an internal review. Magherafelt are not the only web-averse Council. Castlereagh Borough Council - due to merge with Lisburn City Council - doesn’t publish a calendar of meetings or any minutes online. Firstly, hats off to Lisburn City Council for being quite open and publishing a fair amount of information already. And despite asking Lisburn City Council back at the beginning of September (and chasing a couple of weeks ago) whether they would consider publishing details of the Lisburn/Castlereagh transition meetings (visited last week by Lisburn councillor Edwin Poots in his guise as Environment Minister, but normally doesn’t publish its timetable of meetings, location or minutes) - as they promised to do in a public press release - they have still to formally respond. Update - Magherafelt have now started to publish their monthly minutes online. The earliest minutes are from their August 2009 meeting. Perhaps they'll now work backwards towards March 2005 when they agreed to publish them online! At the end of September I mentioned in a post that the District Policing Partnership websites were no longer just not being updated, but were in fact totally offline. My understanding is that as part of upgrading the old DPP website and moving it from its external host to run inside a NI Civil Service data centre, they ran into problems complying with the very strict security requirements for operating in this new environment. Incredibly, it has taken well over a month to sort out the problem, on top of the website freeze of many months before that. Few commercial organisations would tolerate such a prolonged outage. While the world may not stop rotating with the unavailability of DPP information, as tax payers we are underwriting their funding. I used to spend quite a lot of time with work in London. One upside to the travelling was the ability to keep track of the kind of cultural events that you normally hear about on the news but never stand a chance to experience in Northern Ireland. 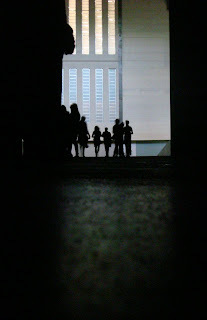 One such annual tease is the opening of the latest exhibition in the Tate Modern's enormous Turbine Hall. Back in October 2006, I stumbled upon the press preview of Carsten Höller's Helter Skelter slides and got some early snaps of adult playground. 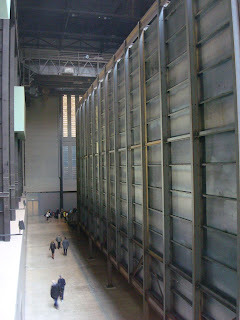 The next year, Doris Salcedo's Shibboleth consisted of a large crack running the full length of the Turbine Hall's floor. 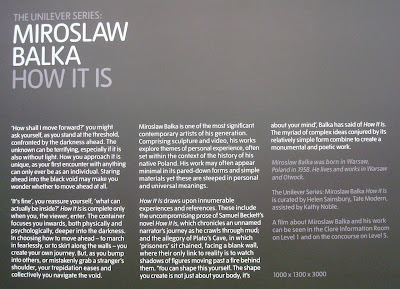 I completely missed last year's Unilever Series exhibition. However, last week, I spent two days in a workshop in a building that has great views of the Tate Modern across on the other side of the River Thames. So one day at lunchtime I wandered over the Millennium Bridge to investigate this year's madness. 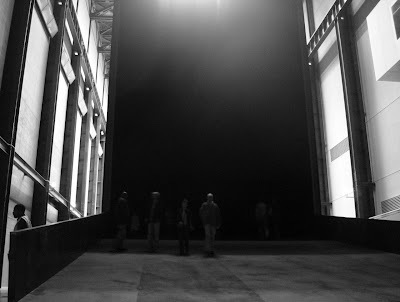 Set on stilts, and called How It Is, Miroslaw Balka has built a huge steel box in the back half of the Turbine Hall, away from the sunlight that streams in the open entrance at the other end. You enter by walking up the gently sloping ramp, and then proceed into the dark void. As you move in, your eyes adjust to the darkness, and you start to make out other people inside the space. Its walls are covered with soft felt, its roof some eleven or more metres above your head. I walked, drawn into the structure, curious what was at the far end. For me, the far end arrived with a surprise and a bump as I literally walked into the back wall. 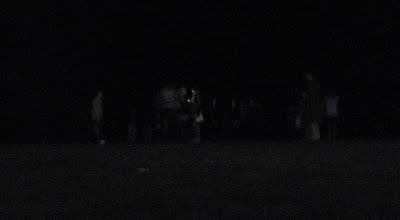 And there I stood for a while, looking back at the other people coming up the ramp and gradually being sucked into the darkness. Walking over to one side, even though I thought I could see the wall, I still bumped into it - perspective and distance are hard to judge when all you've got is black felt to focus on in next to no light! And in the midst of the normally hands-off London where people pack tube carriages like sardines but still don't acknowledge the existence of any fellow passengers, there was a softening as people brushed against each other or bumped into each other in the dark. "Oh, sorry" people giggled as they collided and passed. Somehow the removal of colour and vision humanised the normally frigid London. It was lunchtime, and there were a couple of school groups exploring the exhibition. Some people taking flash photos - which makes for a bad photo as well as ruining other visitors' night vision. On the outside, the 30m long structure seems large. Yet inside in the dark, it has a smaller more intimate feel. Part of me suspected that there's a false back wall? But perhaps not. Somewhere between art and architecture, what does the dark void ask or say? To me, it makes be wonder about people who find themselves locked in darkness - whether kidnapped or prisioners. People who feel depressed and emotionally dark. Blindness. Belfast Synagogue has been a recurring location in my life over the past few years. I’ve toured it, been to a concert in it, and on Wednesday night returned to see the play This Is What We Sang as part of the 2009 Belfast Festival at Queen’s. Written by Gavin Kostick, the play looks back at the story of a Jewish family in Belfast. Kabosh Theatre Company specialise in drama constructed for a particular space, and the 1960s synagogue is a marvellous setting. 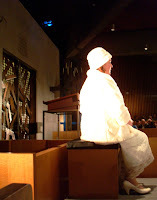 With their white clothes shining in the limited spotlights, the five characters remain on the stages constructed around the synagogue throughout the single act performance. First to speak, Lev’s back story begins with his arrival on a boat into Hull rather than New York. Landing short he felt swindled. His opening monologue charts how he moved across to Belfast, along with his brother. While Saul‘s gift was music and revolving around singing in the synagogue, Lev went into partnership with a local furniture maker, building up a good business, and buying a three bedroom house. But aged 39, affluent and single, he travelled across to Leeds to meet 23 year old Hannah. For her it was love at first sight ... when she saw Lev’s brother Saul at Belfast dock. But she stuck with Lev, and had a double wedding with her sister who married Saul. And so the foundation for the dramatic tension is laid. The only present-day character is Bill - Lev’s great grandson. Laid off from the collapsed Lehman Brothers, he’s come to Belfast at the request of his dying Great Aunt Sissy, Lev’s daughter. Single all her life, she’s putting her estate into order. “Who am I to judge? Do I have a right to say this was a good thing to do; this a bad; so and so was a good person; so and so was wicked? What can you say? That they lived. They were here. They did the best they could. in the time they were in. When I come to the end of my days and my story is told, will I abide the account? But I have no desire to get to the end of my days yet. You know you can’t put right what was done wrong. Yet in the process of exploring his family’s past, the contract-driven, legally minded Bill discovers a freedom from duty and a joy in being driven by feelings rather than results. And perhaps his new approach to life is a form of atonement for his past career. One actor never speaks. Saul sits and stands in the middle. As cantor, he rises to sing at various points in the play. We know that he’s poor but happy. No gets rich being cantor, but the Jewish community value him. He’s crucial to the family’s story, yet he remains a mystery. Only expressing himself - beautifully - through song. It’s an excellent play, with minimal cast and set. A docu-drama in which whilst the unravelling family tale is fictional, the geographic and historical scaffolding is true. As the play unfolds, you hear about Rabbi Hertzog (who went on be Chief Rabbi of Israel while his son became President of Israel), the Millisle Farm (that sheltered Eastern European children from Jewish families during the Second World War), the Belfast Blitz as well as customs and traditions from Jewish culture. The information is dropped into the dialogue quite naturally, and you come out feeling better informed rather than formally educated. There are still some tickets available for performances next week. It’s well worth a trip up to Somerton Road to see. I came to it cold. Prompted by remembering that someone had said it was a must see film, and finding an Odeon guest pass tucked in beside my Oyster Card, I sat down in screen 3 last night totally unprepared for what unfolded during the next two hours. As the opening titles flick across the screen, it’s initially comforting that Peter Jackson is in charge. South Africa, Johannesburg. It’ll be a story about hardship in a township, contrasted with wild animals and state brutality, I thought. Not a million miles away from the actual plot ... though completely missing the alien connection. An alien ship appeared over Johannesburg, and remained there, hovering above the city. Curiosity got the better of them, and the military flew up, broke in, and discovered a ship full of malnourished aliens. They rescued them, ferrying them down by helicopter to the ground. Hospitality extended to building a camp in the city’s District 9 slum to house the newcomers, fencing and barbed wire to keep them separate. Gangly, with crustacean-like exoskeleton and facial fronds, the aliens were nicknamed “prawns”. Dehumanisation. Segregation. Prejudice. Community tension. A black market underworld emerges. Nigerians enter District 9 and trade meat and cat food for alien firearms. 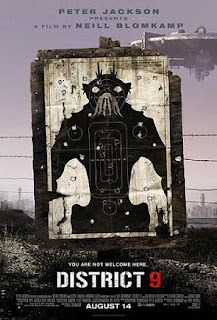 (No surprise that District 9 is banned from cinemas in Nigeria!) Though there’s some kind of biological trigger that means humans can’t fire the powerful weaponry. An unlikely leader, Wikus Van De Merwe is put in charge of the process. Accompanied by the Blackwater-like private corporate militia and expecting trouble, Wikus and his co-workers go door to door getting alien scribbles on the eviction notices. Trouble flares. Arms dumps, contraband, resistance. Searching for weapons, Wikus unintentionally inhales a strange substance and that’s when everything changes for him and the film’s plot crunches into top gear. No longer the top dog, and on the run, cinema goers get a chance to figure out their stance on bio-ethics while Wikus reconsiders his own relationship with the refuge aliens. He needs their help, and they need him. Family bonds, trust, misinformation, aggression: it’s all flying around in the maelstrom of inter-planetary hostility. states an alien - with the perhaps unlikely name of Christopher Johnson - who’s been working on a cunning plan since they arrived. It’s a fascinating film, fast paced, and you never quite know what will happen next. It has violence - at times like a gruesome video game as blood and gore splats on the camera lens. There is an enormous amount of CGI, but you’ll hardly notice as the unspeakable horror unfolds. Man’s inhumanity to man extends to man’s inhumanity to the very aliens they chose to rescue. Replace the aliens with another human ethnic community, and you could be transported to the former Yugoslavia, Rwanda, the South Africa I heard about on the radio over breakfast as I got ready for school ... or I’m ashamed to say, maybe even Northern Ireland. If you can stomach it, go and see this film. (Though I seem to be late to the party and it may no longer be runnign in local cinemas.) And then vow to never allow yourself or others around you perpetrate hatred and segregation. A fine film to see on the evening that Nick Griffin took his seat on the BBC One Question Time panel. I couldn’t get tickets for the Urban Hymns concert in May Street Presbyterian Church last year, though really enjoyed the fabulous film of the evening that was shown later during Belfast Film Festival. 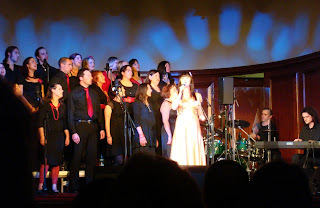 The idea for Urban Hymns was simple: ask well known singers to sing one of their own songs followed by a cover of a gospel song, both backed by wonderful Inishowen Gospel Choir. The film was spine tingling, and the original concert, with performers in the pulpit and people crammed into the pews must have been an amazing experience. 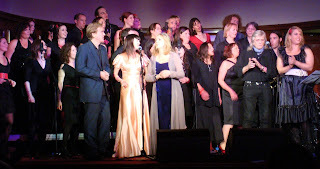 Monday night’s concert - The Unforgettable Choir - was the reprise as part of the 2009 Belfast Festival at Queen's. Away from the cramped setting of an inner city church, it promised a similar musical format in a larger and more luxurious venue. Belfast City Hall has just reopened after 18 months of renovation, and it has flung open its doors and rooms for Belfast Festival events. But the Great Hall lacked the intimacy and character of the church. Lots of credit to Stuart Bailie for pulling together a strong line-up. The performances were good, but the audience were distant from the stage, the sound was a bit muddy and the atmosphere was restrained. 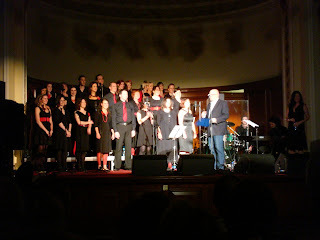 Last year the guest artists were stuck in the pulpit above and behind the choir. This year the band were tucked in behind the tiered staging creating a strange visual dynamic. Bronagh Gallagher - the only female artist last year - was back, throwing her heart and soul into a set that didn’t get the audience reaction it deserved. To be honest I didn’t recognise all that many of the names of the performers - I’m obviously not enough of a music nerd to appreciate what I heard. But Bap Kennedy and Henry McCullough (the latter achieving a two-person standing ovation that beat the rest!) were amongst the on-stage talent. Leave me a comment below and I’ll fill in the rest of the names! 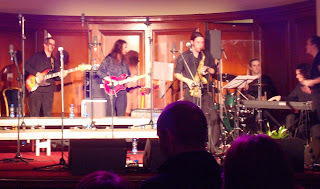 As a long time Moya Brennan fan - my claim to fame could be that I once ate a Chinese takeaway in the same kitchen as her - I expected great things from her as she performed the penultimate two songs of the night. Amazing Grace was good, but the song before dragged. I hope Stuart does it again. The choir are a treasure. Enthusiastic, adventurous and not afraid to sway and dance, given the right material they really lift the performances. But the venue needs rethought. Even the slightly rounded Assembly Buildings with its balcony might work better if numbers are essential to pay for the artists. Last week was frantic. On top of a busy week in work, I was over in Salford on Tuesday evening and all day Wednesday. This district of Manchester is part way through a massive regeneration. Out of the derelict Manchester Docks in the shadow of Old Trafford football ground has emerged Salford Quays. 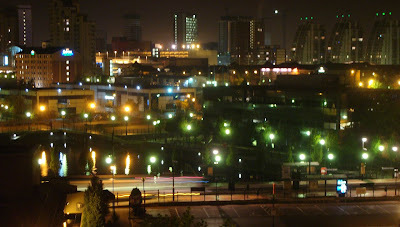 The hotel room overlooked the waterways, modern high rise apartments, The Lowry centre and MediaCityUK. 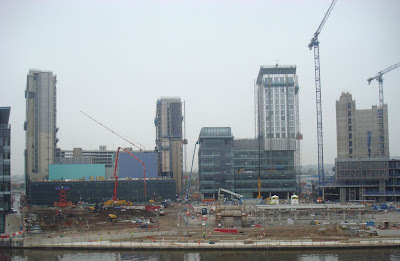 From the top of The Lowry, the MediaCityUK complex can clearly be seen which will include the BBC buildings that will house five major BBC departments (Sport, 5 Live, Children's programmes, Learning, Future Media & Technology) moving north from London by 2011. A far cry from the time when it looked like a continuation of the Coronation Street set, and no doubt a considerable distance from redeveloping a thriving local community spirit. With the alarm clock ringing at 04:15, Thursday morning was meant to involve catching the 06:30 flight from Belfast International to Gatwick, a train journey into Blackfriars, and the start of a two day workshop. All went well until the hinge broke when a member of the cabin crew who had perhaps breakfasted on spinach closed the front left door. With no spare hinges in stock in Belfast, the solution looked like a short delay while the door was sealed and then everyone piling down to the back of the plane to sit in-between the working over wing and rear emergency exits. But this fine plan was overruled by the weight distribution graph that predicted that the aircraft’s tail might hit the runway as we took off. So the pilot came out of the cockpit and delivered the bad news from the cabin, explaining all that had gone wrong and the consequences. It was a master-class in how to deliver bad news. The flight was cancelled, and everyone was ushered back to security to make their way back to a check-in desk to rebook onto later flights. That’s the point that it really all went wrong. Security wouldn’t let us out. Menzies ground staff were scolded for even suggesting we walk back through the security area. Eventually security found a key for a door and escorted us all out to the public concourse. With half an hour’s notice it all seemed a bit of a shock for the staff when 95 of us arrived at check-in desk 15. Some went home, many of us booked onto the 10:15 to Stansted, and others onto the afternoon flight to Gatwick. While the “happy path” process for boarding a plane seems well understood, the ground crew seemed a lot less sure about the “unhappy path” process to follow when things went wrong. An hour later, while I sat scoffing the tea and a muffin that a £3 airline food voucher can buy, the tannoy announced a two and a half hour delay to the 10:15 Stansted flight. The plane I’d originally boarded was meant to fly Belfast -> Gatwick -> Belfast -> Stansted. With non plane arriving in Gatwick, there was an inevitable delay moving the “spare” plane down from another airport, which delayed the Gatwick -> Belfast arrival, and consequently delayed my replacement flight to Stansted. Another voucher, a plane with a standby crew and a front door with a working hinge (pictured), I arrived in central London some six hours after I intended to. The last two hours of the first day’s workshop turned out to be very worthwhile – even though I was exhausted. The pinnacle of the day was wandering across to Yung’s in Chinatown. They still recognised me and still remembered by usual order. Not bad after a nine month absence. 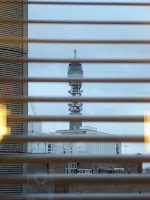 And back to a grim hotel with a familiar view. Spot the missing vital fact? Flicking through the Lisburn Echo free sheet, this article at the top of page three caught my eye. Sitting watching William Crawley and Losing Our Religion on BBC One, I came across an article about another holy matter. If you can remember back to November 2005, Channel 4 ran a short series of three programmes with the slightly disingenuous title of Priest Idol. It focussed on the appointment of a new priest for the Church of England parish of St Mary Magdalene Church in Lundwood, Barnsley. Like many smaller congregations, it was a shrinking urban church, with an ageing attendance, and buildings in a bad state of repair soaking up money. "Our Harvest Service at Asda was an excellent opportunity to encourage our congregation, many of whom were not church goers prior to three years ago, to consider our outreach to the community. We had a successful morning in terms of having many people of the congregation join us at Asda outside the safety of their usual seats in church." "There were two goals in this exercise. The first was to offer a friendly glimpse of our congregational life for many who find stepping inside a church either a scary or boring experience. The second goal was to collect money for Self Help Africa, a charity that helps farmers in very poor regions of Africa to become self-sustainable." "It was a learning experience for all us in terms of how we might conduct a similar event in the future and how we might increase our hospitality and our willingness to be flexible in order to communicate better with contemporary society. Bridging the gap between the pew and the community has been a major part of my ministry at Lundwood starting with television cameras and a major marketing firm, but then trying together as a congregation without the bright lights to be flexible, creative and welcoming." Now the Yorkshire Post brings the news that James McCaskill is moving on from Barnsley to take up the challenge of rejuvenating "a failing congregation in his native America". 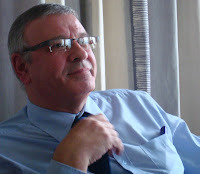 Mr McCaskill ... said goodbye at the weekend. He said he had not taken the decision lightly to leave but said he was looking forward to using the skills and insights learned in Barnsley to help rebuild the congregation at a church in Washington DC – just down the road from the White House. "The past five years in Lundwood have offered some of the most challenging and I think some of the most rewarding experiences I have ever faced. "Again and again, people ask me 'if it has worked' and my response is that I leave behind a church that is completely transformed compared to the one I first visited in September 2004. The building, the grounds, the congregation, and importantly, the community perception of the church have risen from depths of bleakness to new heights of possibilities and hope for the future." It’s a small party in comparison with the big four (or even the big five), and it won’t get much coverage beyond a few minutes in weekend news bulletins and a report on Sunday’s The Politics Show. But perhaps there’s merit in listening to what the smaller groups have to say? With the resolutions and motions behind her (including that one), the sessions about restorative justice and education digested, and Denis Bradley’s input carefully listened to, Dawn Purvis closed the PUP’s annual conference with her leader’s address. For Dawn Purvis it was a year where the peace process moved forward but the Executive didn’t. A year where the UVF and Red Hand Commandos had completed decommissioning and the UDA had made a positive start. A year where “the criminal murders of Sappers Quinsey and Azimkar and of Constable Carroll could have derailed the process”. She quickly moved to the challenge of “dealing with the past”. Like nearly all the speakers at the party conference, upcoming elections weren’t far from Dawn Purvis’ mind. While it went on an hour longer than timetabled, for me attending the PUP conference in the capacity of a blogger was an interesting and thought-provoking experience. Conference delegates were more varied than the party’s loyalist working class roots, and the party policies looked beyond their heartland to see vulnerable groups across Northern Ireland. No one and no where seemed out of bounds. Education schemes in Short Strand were celebrated, Denis Bradley was warmly welcomed, and gate-crashing bloggers even got printed copies of the main speeches! 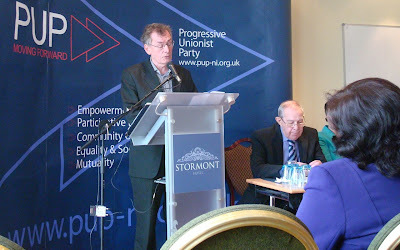 Denis Bradley addresses the PUP! After a set of sessions with external speakers addressing restorative justice and education it was over to Denis Bradley. He got a warm welcome, attentive listening, and no oohing and aahing or heckling. Compared to the riotous behaviour of those attending the Consultative Group on the Past’s report launch back in January, it was like Bradley had turned up at a Sunday School picnic. Though in a sense he was on home ground, with an audience who appreciated the greyness that divides victims and perpetrators, and an audience that has felt largely ignored by the larger unionist parties. It’s been a while since anyone on the Eames/Bradley commission has made public comment. Bradley indicated that he’d been taking it easy in recent months, so his twenty minute speech was a good opportunity to catch up with how he viewed the political situation and reactions to the report. Regular AiB readers may well ask, is all this PUP stuff relevant? Like all posts, it’s what catches my eye at the time, what intrigues me and what might benefit from being recorded and discussed - online or offline. East Belfast is a complex community, but not unlike many others across Northern Ireland. It has issues particular to its area, including social depreciation, dodgy sewers, areas segregated by peace walls, majorities that are anything but cohesive alongside minorities, as well as new developments, new people and new investment. The kind of issues that Bradley picks up in his prepared speech are those that will affect political negotiations over the timing of the devolution policing and justice (and the sweeteners that may accompany that process) as well as the stability of the DUP/Sinn Fein-controlled Executive. While many of us may shy away from being (party) politically involved, political machinations affect us all. Beginning with his analysis of pipe smoking at formative encounters of listening and telling throughout the Troubles and the peace process, Bradley recollected that he’d been smoking “in 1994 on the first night the Brits sat with Martin McGuinness and Gerry Kelly. Bradley was surprised at just how loath unionism was to acknowledge that there was wrongdoing on both sides. The place of truth and the unlikely success of a truth commission got a mention too. Slugger has already picked up on Bradley’s prediction of a future Conservative government’s policy around the Consultative Group’s report. Indeed, at the recent East Belfast Speaks Out event, Shadow Minister for Northern Ireland Laurence Robertson said it would be Tory policy to draw a line under the past, with no new enquiries. “If what I am hearing is correct then the Conservatives will bin the report on the past. In its place they will suggest a memorial hospital or something of that ilk, and a moving on, leaving the past behind. It won't be as crude as that but it will amount to leaving the past to be dealt with by the passage of time and the death of those who feel most affected by the troubles. Other unionist parties might have massive reservations about inviting Denis Bradley to speak: the PUP looked like they'd be carrying on the discussion with him at lunch. Every now and again, politics looks like it's growing up! With media interest and an increased emphasis on professional presentation, party conferences are still the one opportunity for members to shape and change policy. So amidst fine speeches it’s inevitable that some internal dirty laundry will get aired. Ervine sensed a hypocrisy that you can’t smack your child but can abort a foetus. He proposed alternatives of “good old fashioned chastity ... contraception ... have the child and love it ... have the child and have it adopted”. He stated that allowing social and non-medical abortion in Northern Ireland would increase the number of abortions taking place. And he felt that the continued pro-choice policy was putting people off the PUP. Nietzsche and his “God is dead” got a mention in Erwin Higgins seconder’s speech. During the debate that followed, speakers pointed to the current legislation - the 1861 Offences Against The Person Act - that was before the invention of the light bulb. Some rejected the religious fundamentalism language and pointed out the PUP wasn’t a Christian Socialist party, Others felt the motion was “a direct attack on Dawn’s leadership”. And it was equated to discrimination on geography and income (ability to fund travel to England). 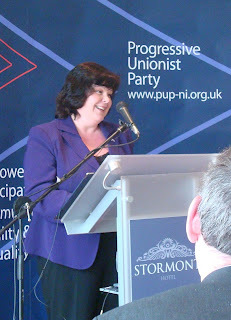 After five male speakers, the last contribution came from a woman, Dawn Purvis - leader of the PUP. She noted it was a party policy before she joined. She saw the PUP as a party that “faced hard issues head on”. Fence sitting was for the Alliance party. 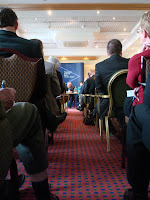 As a party conference first timer, a non-party member, and someone who thinks about politics but steers clear of getting involved, it was an intriguing sight to watch around 60 party faithful turn up at the PUP conference in the Stormont Hotel. New party badges being worn; more ties than the average church service; four men for every woman; young couples as well as older men. Party President Councillor Hugh Smyth kicked off the morning with his opening reflections. He noted that in olden days, if republicans said something or , then he wouldn’t believe it or support it. Now that’s not the case. He cautioned that the same can be true of the DUP. In his view, Peter Robinson was playing a “good game” and shouldn’t be written off. Despite their socialist links, he’ll be glad to see the Labour Party out of power. For the Conservative party, he had a shopping list. While cuts were inevitable, they shouldn’t be focussed on the poor. Declaring a personal interest, he wants free television licences for all pensioners. He supports a pro-choice agenda - that’s pro-choice on retirement. The retirement age should remain at 65 and not rise. But in parallel, companies shouldn’t be allowed to force employees to retire at 65. It’s up to the individual. Finally, after equating the House of Lords with a House of Sleep, he called the party to be prepared for the possibility of Assembly elections earlier than 2011, and to get behind their leader Dawn Purvis. Darren Logan introduced a resolution challenging racism in protestant areas. The rest of the day will ask conference to adopt a policy that would encourage the creation of local social enterprise and economic cooperatives, attempt to reverse the party’s pro-choice policy on the introduction of the 1967 Abortion act (it failed) before looking at youth offending, social justice, education, finishing with an address by Denis Bradley and then Dawn Purvis’ party leader’s speech. 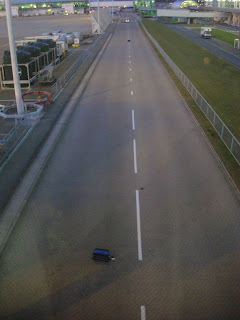 The lights in the distance belong to a luggage truck coming back to pick up the bags strewn up the road inside Stansted Airport. Travel frequently and you fall into a rhythm that keeps you right. You check in online the day before, set your alarm for the early start, pack your bag the same way with the same chargers, use one of those small resealable bags instead of a toilet bag. Even the route to and through the airport, efficiently getting to and through security, grabbing breakfast before the flight is called. So now that there’s a lot less travel with work, I find myself missing beats in the travel waltz. I’ve got to make the calculation each time to figure out what time I get up at to catch the 0615 flight to Stansted. And I make mistakes. Like Wednesday when I left my rain coat behind on the plane. I guess it was early in the morning, we’d been moved down from near the front of the flight to the back (low passenger numbers and practically no checked-in bags meant a bit of human load balancing was necessary to make sure EZY254 would actually take off), and my bag had slithered from one overhead locker into another during the flight. So I either left my blue coat in the locker, or sitting on the seat while I got my bag down. A stupid mistake. We are sorry that you have lost an item inonboard [sic] one of our aircrafts. We will do everything we can to help find and trace your lost item and return it back to you. Further on down there’s a number for Stansted airport. Except it’s the number for lost luggage (checked-in bags) not for lost property left behind on the flights. And the lost property office doesn’t often answer the phone. Instead, their answering machine asks you to leave a message along with your number and they’ll call you back. I did, and they didn’t. Knowing that I was going home through Stansted on Thursday evening, I phoned again, got through to someone this time who said that they were based 5 miles outside the airport and only picked up lost property once a day, so they wouldn’t have my coat yet. Could I call back. I did, and it went to the answering machine. So in the end, I’ve returned home minus a rain coat. If they ever phone me back, or if I ever get through to them and the coat is there, I’ll probably have to pay huge postage to get the coat back (rather than being able to pick it up yesterday on the way back to the airport). After ten or more years of use, the Berghaus jacket doesn’t owe me much. Maybe it’s a sign that it’s time for a new coat! You might be forgiven for thinking that Lisburn’s development, including the two fires in 1641 and 1707, has been a bit random up to now. But no longer. 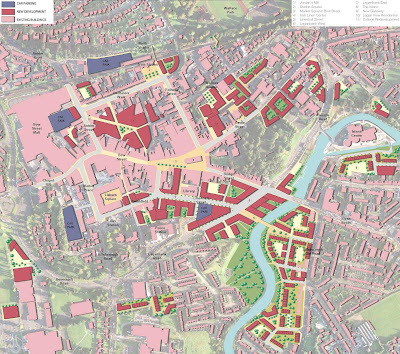 Lisburn City Council along with the Department of Social Development and Lisburn City Centre Management have employed consultants (GVA Grimley, EDAW and Faber Maunsell) to construct a masterplan. And over the last month or so they’ve been consulting the local ratepayers to canvass their opinion. In case you’ve missed the exhibition display boards tucked in beside the stairs on the way out of Lisburn Library or the alternative set in the Island Centre, there’s also a seven page PDF of the posters. You have until Friday (9 October) to feed back “your views by completing one of the questionnaires provided at the exhibition.” I’ve a feeling that Paul McCormick (LCC Economic Development Unit) and Alan Clarke (City Center Manager) may also welcome your suggestions by email (on paul DOT mccormick AT lisburn DOT gov DOT uk and alanclarke AT lisburnccm DOT co DOT uk). 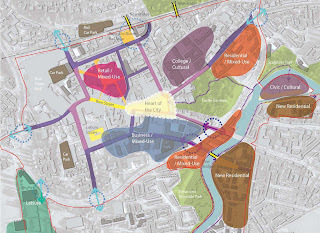 As well as plans to making more use of Lisburn’s historic assets (“provide a positive context for investment in the historic environment ... to enhance the visitor appeal” in consult-speak) and opportunities to reconnect the city centre with the River Lagan, the masterplan makes a pitch to strengthen Lisburn’s retail offering. There seems to be an emphasis on removing “street clutter” and simplifying the “street furniture and lighting” in Market Square and Bow Street. The area around Jordan’s Mill and the Graeme Gardens multi-storey car park would be transformed into a retail space, with the car parking relocated to the outskirts of the town centre (primarily on the other side of the railway track at Lisburn Railway Station, to the southern side of the North Circular Road). The car park currently front of the train station will be flattened, creating a new “pedestrian friendly” “public square”. 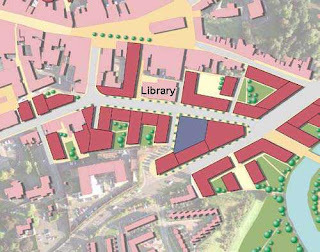 Lisburn Courthouse also seems to be flattened as part of the masterplan. Also in the plan is the observation that “the City Centre does not currently offer hotel accommodation”, acknowledging that Lisburn’s only hotel is a good fifteen minute walk from the retail centre. Also missing is “a wide choice of restaurants, bars and an evening entertainment offer that would contribute to the overall performance of the economy and trading potential of local businesses”. Which I think means that nearly everything shuts at dinner time and there’s no reason to step over your doorstep in the evening. Modern office accommodation is also lacking. The answer here seems to be the creation of a new Business Quarter around Linenhall Street with 300,000 sq ft of commercial office space, a hotel and smaller retail/leisure units on the sites of the Royal Mail Sorting Office and yard, the Health Centre and part of the public car park on the hill. And over on the far side of the river, behind the Island Centre and in-between the River Lagan and Hillsborough Old Road there are plans for a pedestrian boardwalk, cafes and bars, a new pedestrian footbridge as well as a range of 250 new homes “for sale and a choice of affordable homes”. Oh, and three more opportunities for “gateway public art”. So what do you think? Can Lisburn sustain any more retail? Will the car parking be too far out of the city centre for short-breathed bag-laden shoppers and tired toddlers?